If your shop is looking to expand your service offerings and maximize profitability, you need to look into Challenger 4 post lifts. They allow the most workspace underneath vehicles, to provide more than enough space to get various tasks done. These are an ideal choice for all mechanic shops working on light and heavy duty vehicles. Check out all of our products today! Challenger CL4P7 4 Post Storage/Service Lift 7,000 ALI Cert. Challenger’s Home Storage/DIY light duty general service lifts are commercial-grade, yet economical for DIY enthusiasts. Features 115v or 120v electric/single hydraulic cylinder w/ cable system for simple plug in and lift capability. Can be free standing for mobility or bolted to the floor for even more stability. Challenger CL4P9S 4 Post Storage/Service Lift 9,000 ALI Cert. Challenger Lifts’ 14,000 lb. capacity 4P14EFX and 4P14XFX economy four post car lifts are loaded with features you would expect to pay more for, like louvered approach ramps, solid piece column construction, automatic wheel stops and the highest rise in the industry. Challenger Lifts’ 4015series 15,000 lb. four post automotive lifts are the complete package for expanding your service offering and revenue potential. This 4015series four post lift is an closed front general service flat deck auto lift. Height of Columns: 7' 6-1/2"
Width Between Columns: 223 1/2"
Challenger Lifts’ 4015series 15,000 lb. four post automotive lifts are the complete package for expanding your service offering and revenue potential. This 4015series four post lift is an open front general service flat deck auto lift. New Black Color Challenger Lifts 18,000 lb. capacity medium duty 4 post lift is great for shops servicing light and medium duty vehicles. The 44018 four post vehicle lift features a superior lifting system with high tensile strength lift chain and sealed roller bearings for maximum reliability. New Black Color Challenger Lifts’ 4030 Series Heavy Duty 4-Post lifts is built on a time-proven cable and cylinder design system using heavy-duty steel sheaves and cables. New Black Color The 30,000 lb. capacity heavy duty four post truck lift features a superior lifting system with high tensile strength leaf chain and sealed roller bearings for maximum reliability. Heavy Duty hydraulic cylinders provide optimum lifting with minimum maintenance. Overall Width: Min. 27" / Max. 41"
New Black Color Dual configuration, the 44012DLR features a staircase and catwalk, connecting two lube racks, allowing technicians to move from one bay to another for the most expedient express lube shops. New Black Color Challenger Lifts 40,000 lb. capacity heavy duty four post truck lift features a single point air actuated lock release system, velocity fused redundant hydraulic safety system, a superior lifting system with heavy duty leaf chain, sealed roller bearings for maximum reliability and a variable-synchro power system. Our choices include many useful features like solid construction, automatic wheel stops, and louvered approach ramps. The most important aspect that comes with car lifts has to be versatility, and safety, and Challenger 4 post lifts deliver on both. They come with every accommodation, and tool needed to safely position the vehicle to get the job done. There are countless lock positions that are consistent, and reliable for your employees to use. With a single push button, you can lift and lower the vehicles with ease. Many of our choices also include rolling jacks, an oil drain pan kit, an internal air line kit, and a workstation to provide any servicing needs. We offer the best variety in the business when it comes to 4 post lifts. Our choices can meet the weight capacity from 3,000 to 74,000 pounds. You can find one that meets the needs of the vehicles you work with on a daily basis! 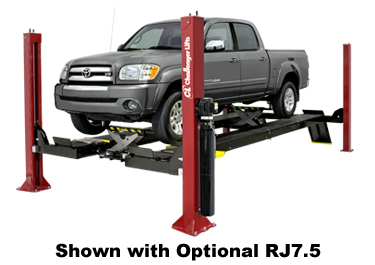 Investing in one of our strong, dependable Challenger 4 post lifts would be a great option for your mechanic shop. You will find tough tasks easier to accomplish, your employees will be safer, and the quality of work will improve. Whether you’re working with small vehicles, or heavy duty trucks, we can find one that will get the job done. Our selection is full of various choices that are known for being durable, efficient, and effective for your business. All of our Challenger 4 post lifts are easy to operate, and can safely lift any vehicle with ease. Whether your services specialize in oil changes or more critical work, it is ideal to have a lift in every mechanic shop. We invite you to browse our options and select one that makes sense for you!